Classic or modern, Ada's elegant solitaires come in a variety of settings to suit your unique style and can feature lab grown diamonds big and small. Your Ada Concierge will help you design the perfect setting to bring out the brilliance of your lab created diamond. Lab grown diamonds are optically and chemically identical to natural diamonds and vary in quality among the 4 C's. 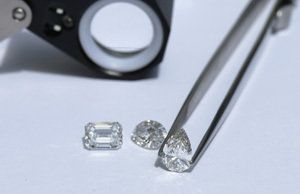 Lab diamonds are graded, appraised, insured, and re-sold just like mined diamonds. Learn about the future of fine jewelry.